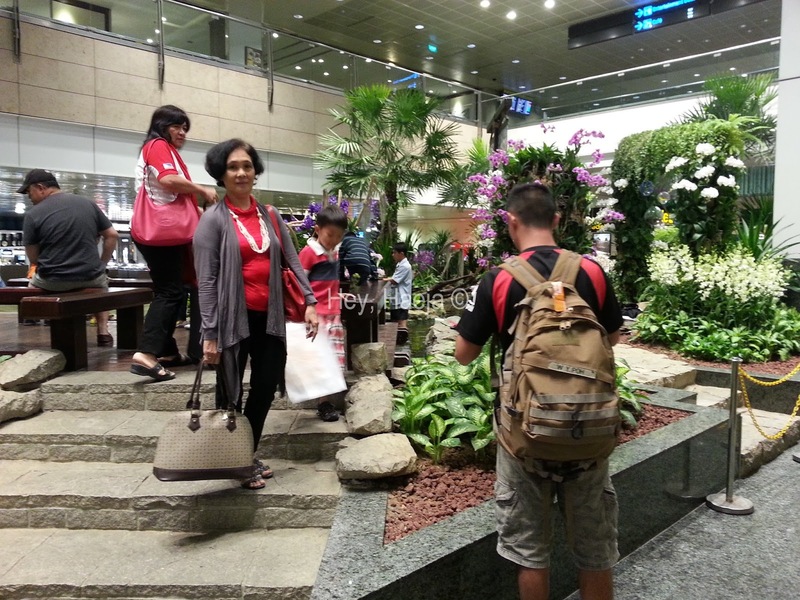 The garden feature inside Changi Airport. 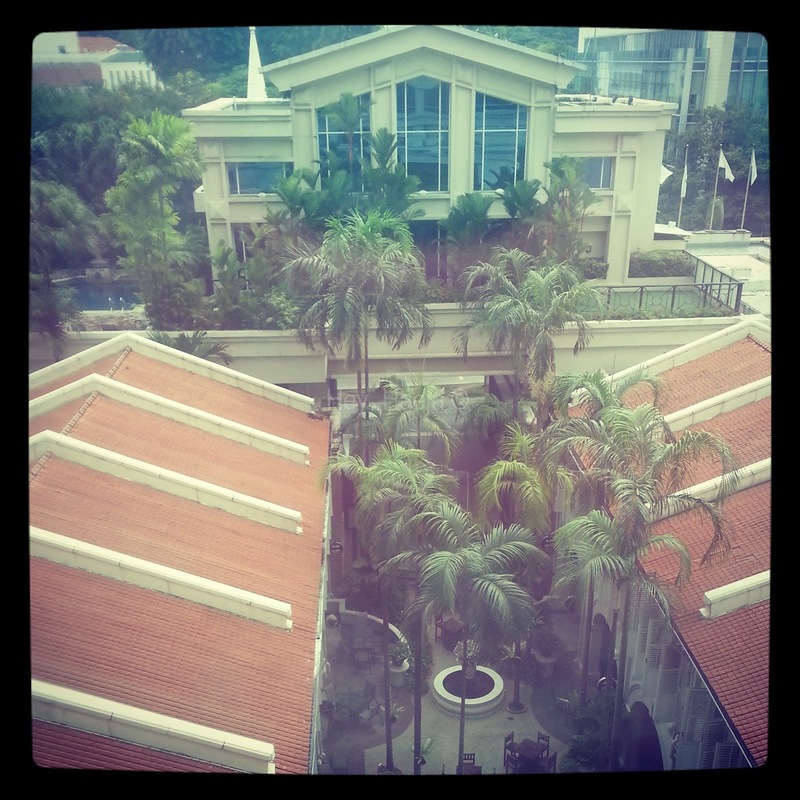 Last weekend, I was in Singapore for work and leisure. Being a Filipino and a freelancer, with no office connections, can be quite hard especially if you want to go to other countries because they have this presumption that you’re going to be a TNT (which is quite discriminating). However, my mom and sister were with me so the immigration officers did not question me and I was able to get thru without any trouble. My co-worker, however, was actually interviewed for a while and was put on the “watch list” to see if he’ll truly come back. They questioned him because someone else paid for his ticket (our client/boss that we will meet in Singapore) and no itinerary. For the record, we both came back of course. 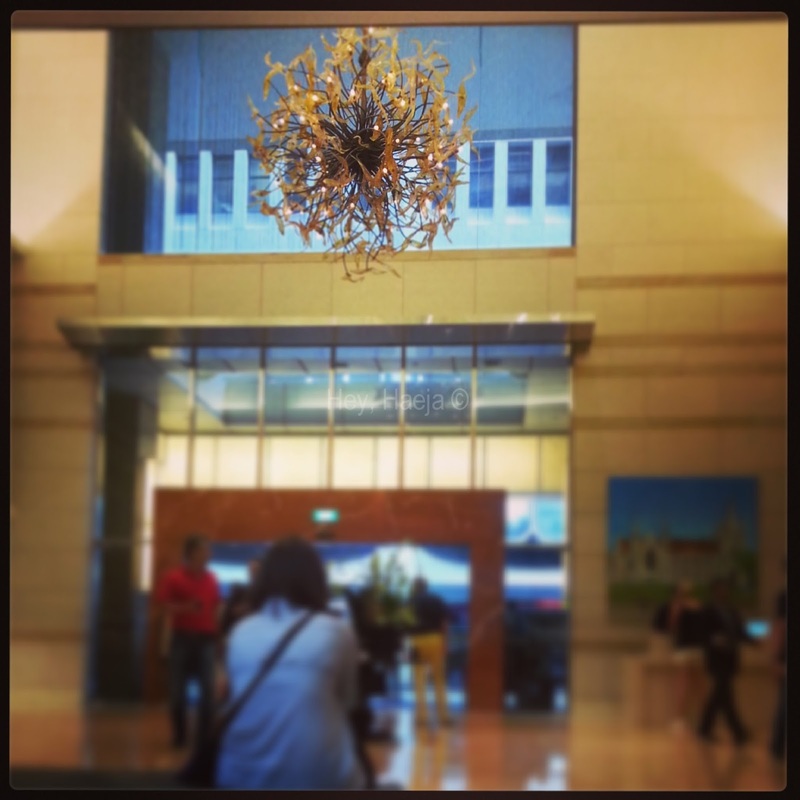 Beautiful chandelier in the lobby! But anyway, that’s not the whole point of my story. We arrived in Singapore on Friday morning, and after an hour, we were finally on our way to our hotel, Grand Park City Hall in Coleman Street. We rode the taxi and paid about S$15. I didn’t compute the conversion in my head anymore – one of my promises when shopping abroad for things I cannot find in the Philippines. Grand Park City Hall is stated to be a five-star hotel but it honestly felt like four stars to me. 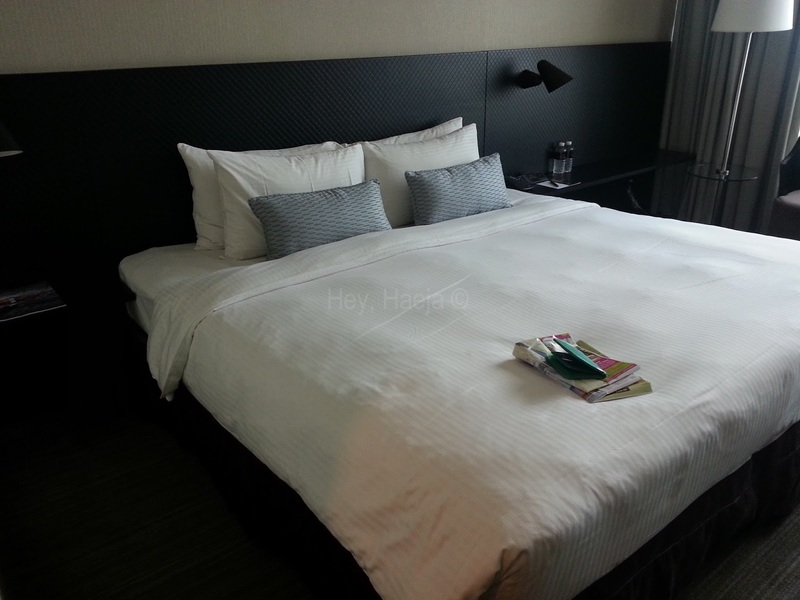 I stayed in M Hotel (in the Business district) last year and I was more satisfied with their rooms. I did not eat in Grand Park City Hall as well because the food was too expensive. 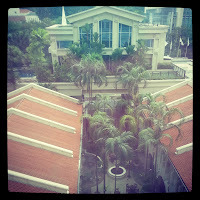 View of the courtyard from my mom and sister’s room. I think I would have been more satisfied with the room if I didn’t have another hotel to compare it to. However, as it stands, I did, and I preferred M Hotel better. However, Grand Park City Hall does have its merits such as its nearness to the Parliament building, if you want to visit, Funan Digital Mall (where digital products are sold cheaper than in the Philippines), and the Philatelic Museum. The hotel is also near the City Hall train stop so getting around the city by train was easy. Lugging around a five-pound shopping bag from the train to a hotel is not an easy feat so I really appreciated its location. ﻿﻿I got their cheapest package, with a superior room on the 7th floor, with internet access but breakfast was not included. The bed was quite lumpy and felt old, there was no thick duvet like with other hotels, but it was oh so glorious to sink into those plump pillows at night with no one to share them with. 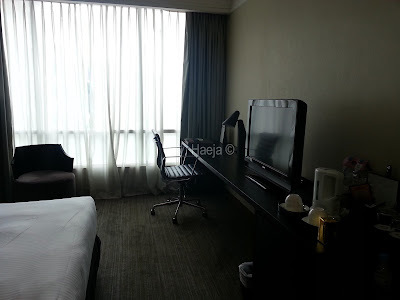 The room and package was actually good for two but I was alone in the room and I loved how spacious it was. The bed could fit two adults, and three (although a bit tight) if you’re saving money. 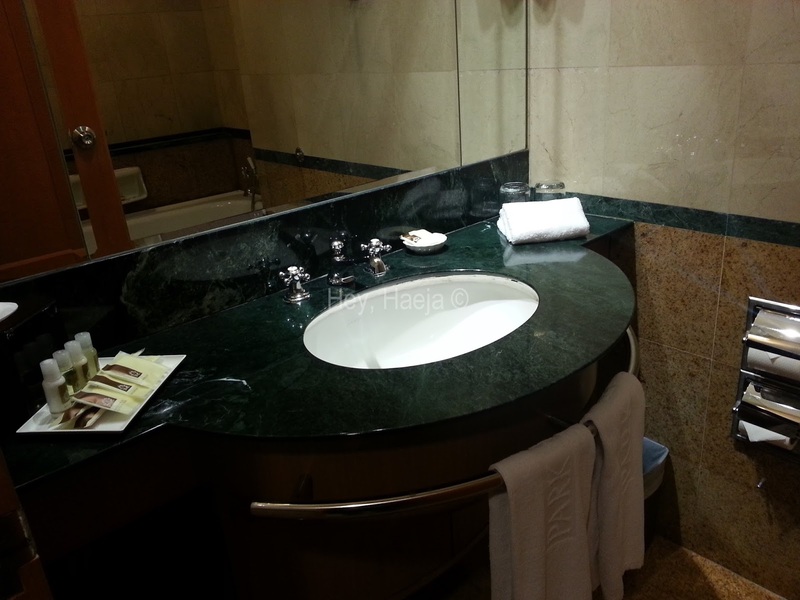 By Singapore hotel standards, the room was actually big. My dad said it was an indication that the hotel is old. There was space to walk around, and if you had big luggage, you could store them under the table with no problem, or in the space beside the bed. I also had this huge TV, which I didn’t get to use because they didn’t give me a remote. But since I was so busy all those three days, I didn’t have time to watch anyway. There was also a pen provided and some envelopes and sheets. The requisite menu and spa services brochure were also on the table, with a lamp. One of my complaints (and others’ too, based on Tripadvisor) was that the room is too dark. They had no ceiling lighting over the bed, just several lamps around the room and one overhead light in the short hallway outside the bathroom. They provided me with complimentary two water bottles (not those Evian ones) and they also gave free tea and coffee satches (Nescafe). I didn’t use these facilities, but my sister enjoyed the teas. 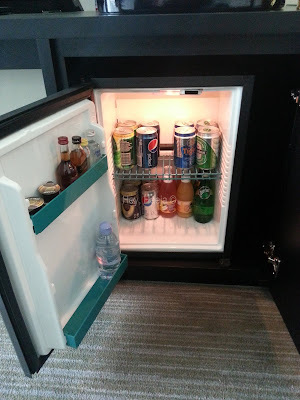 The minibar stock, which I also didn’t delve into. Now, we go to my next favorite part of the room: the bathroom. It was quite roomy for hotel standards. There is space to change without banging your limbs around the place. The bathroom was clean although the colors are quite outdated. The amenities were restocked daily, although the soap I was already using was not replaced. As with usual hotel amenities, the shampoo dried my hair and my skin. They gave me two toothbrushes everyday, and several rolls of tissue. They thoughtfully supplied me with cotton buds and a makeup pad too. I also got a fresh shower cap daily. I used their lotion and it was okay, nothing special, but it helped my skin from drying out. Surprisingly, my face peeled and I don’t know why. My biggest surprise was the bathtub! Since I only got the superior room, and the room’s description in the website didn’t include a bathtub, I wasn’t sure I’ll have one. The other rooms in the hotel included a bathtub in their description, so I really thought I’ll just get a glass stall with a shower. 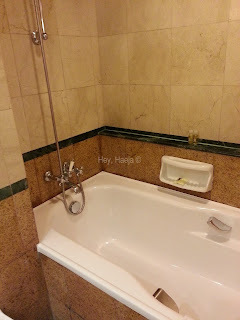 A bathtub is one I really look forward to when travelling abroad because I want to take a dip after a long day (and we don’t have one at home). It was huge enough for me, and the tub was easily filled and drained. It was also easy enough to manage the hot and cold faucets. They also supplied me with a rubber mat so as to avoid slipping while taking a shower. Sadly, it wasn’t thoroughly cleaned. There were stray hair strands on the first day; thankfully, they were long enough so I assume they didn’t come from “down there”. There was also a soap and shampoo and bath gel beside the tub. The room at night. See how spacious it is? View of the pool outside my window. As I mentioned, the package we got included unlimited wifi during our stay there. However, the connection kept dropping out, and was quite slow. There were also times it did not work. When I got there, I could not contact my boss at all and I had to use a SingTel simcard to text his NZ number, which was thankfully on roaming (I don’t want to think about how much his replies to me must have cost him). The location of Grand Park City Hall was good and accessible, and I actually managed to fulfill my list of places to visit: the Philatelic Museum to buy some reproduced vintage-looking postcards ($4 for six postcards! ); H&M in Orchard; River and Night Safari; and Funan Digital Mall. However, there are no places open for a night cap or for midnight snacks. The street at the back of the hotel, which is quite busy and facing several malls, was not well-lit, and there were stacks of garbage out front around midnight, so the scenery isn’t so stimulating at night. These are things I’m sure of because I got back to my hotel past 11 in the evening, and went out again by midnight to walk around with my sister. If you’re going to book there, make sure to really get one of the higher floors for a more scenic view. They have six elevators so getting to your room will not take a long time. Tip: To use the elevator to go up, insert your keycard on the slot, pull it out and wait for the light above the key slot to go green. Once it flashes green, press the number of the floor you want to go to. If the light flashes red, you have to repeat the whole process. 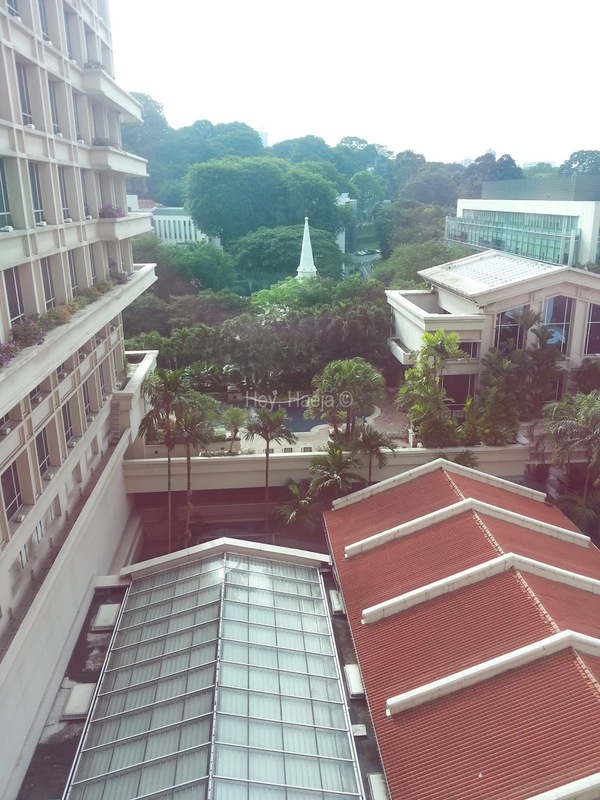 The Grand Park City Hall was good enough for me since I just stayed there to sleep and take a bath. Although I slept for about only eight hours in total the whole three days I was there, those hours were slept in peaceful and deep slumber, despite the lumpy bed, yes. I’m usually easy to rouse, but it took my mom several tries to get me to wake up. I didn’t mind the few lines/scratches on the tub. 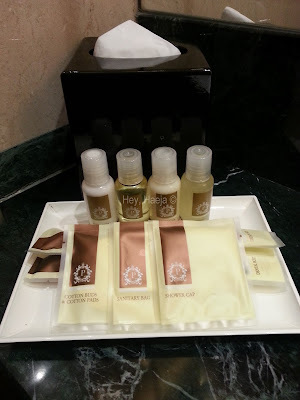 I appreciate that they kept my room clean, and my bathroom amenities taken cared of. 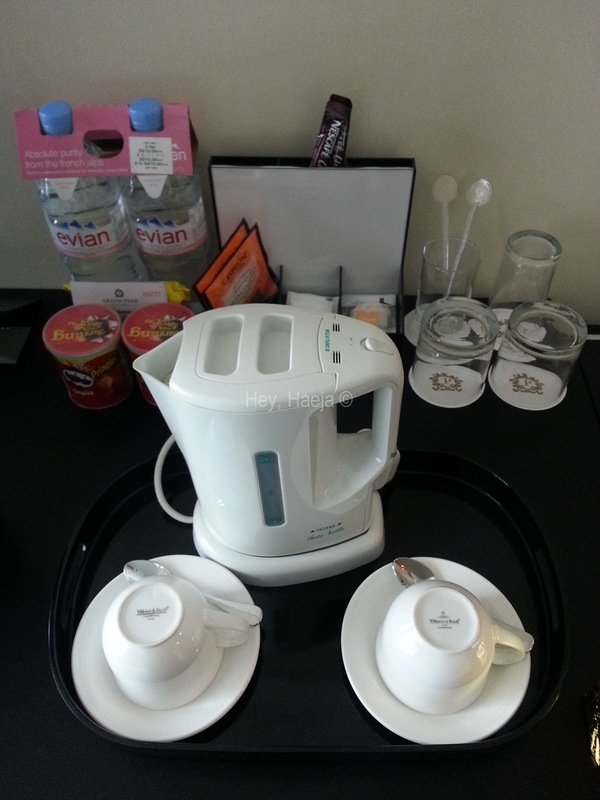 The concierge was very nice and helpful, and I give him four stars for his service. They also have a free shuttle service from the hotel to several other places in Singapore where there are other Grand Park hotels, so we were able to get a free ride to Orchard to go to H&M. The Grand Park City Hall served my purpose well, and I’m just thankful that I had a restful stay. What’s your favorite hotel in Singapore?